Triad Speakers has now announced that they are shipping their new Nano OnWall LCR 3.0 loudspeaker. 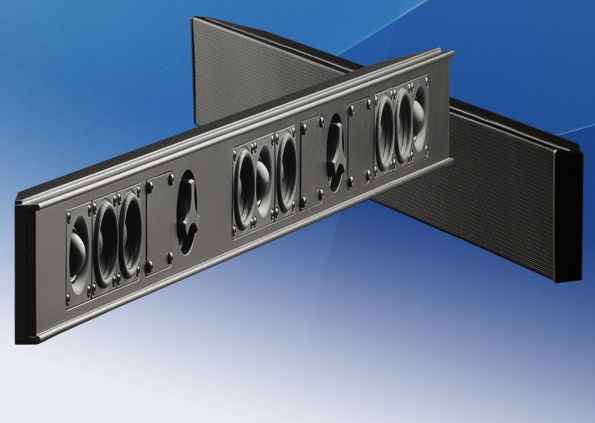 The Nano LCR is a single on-wall ensclosure that incorporates three-channel into a single passive soundbar loudspeaker. To complement today’s slimming HDTVs, Triad has made the Nano as slim as possible, in fact, it is Triad’s thinnest soundbar to date – measuring just 1.6 inches deep – and that’s including the grille. The speaker is also only 3.25″ high. The Nano OnWall LCR 3.0 comes in both custom widths and custom paint finishes. A wall bracket for easy mounting is inlcuded, together with a special bracket that allows the Nano to mount directly to the TV. The Nano LCR 3.0 represents the first of a new series of ultra-compact sound bars from Triad that utilizes this new design process using extruded aluminum. The speaker is manufactured to order in Triad’s modern factory in Portland, Ore. In addition to custom paint-matching, the company offer optional (at extra cost) custom-sizing in widths to match the length of the video display. The new Nano OnWall LCR 3.0 has a MSRP of $1,200 U.S. Look for more details on this, and others frim Triad, at: http://www.triadspeakers.com/.